More than 400,000 utility customers remained without power Thursday morning as thousands of rescue and utility crew members spread out across coastal and rural Panhandle communities to respond to the devastation inflicted by Hurricane Michael. Gulf Power, which provides electricity in hard-hit Bay County, anticipates people in the impacted areas could be without power for weeks as the utility rebuilds parts of its system. A state emergency-management official said all hospitals in the impacted region have reported some form of “critical failure” — water and sewage problems or infrastructure issues such as crumbling walls — that required patients to be relocated and medical field hospitals to be set up. The official said that after Hurricane Irma in September 2017, a field hospital was required in the Florida Keys for a year, and similar situations may be required with Michael. Similar issues were arising at nursing homes, and crews were flying in supplies to Florida State Hospital at Chattahoochee, which serves patients with mental illness. Meanwhile, the state is expecting a surge in humanitarian needs, from a lack of food and water to housing. Scott was set to travel Thursday afternoon with the Florida National Guard to Panama City and Mexico Beach, where Michael came ashore midday Wednesday with 155 mph maximum sustained winds, the strongest ever recorded in the region. Scott, who expressed frustration about people dismissing evacuation orders on Tuesday as Michael rapidly grew into a Category 4 storm, told evacuees not to return home as roads remain closed by flooding, downed trees and power lines. “It’s going to take some time to survey and clear all the roads,” Scott said. U.S. Sen. Marco Rubio, R-Fla., tweeted late Thursday morning that President Donald Trump granted a request for federal assistance for 14 counties: Bay, Calhoun, Franklin, Gadsden, Gulf, Hamilton, Jackson, Jefferson, Leon, Liberty, Madison, Suwannee, Taylor and Wakulla. “He is committed to making every federal resource available to help the recovery,” Scott said. In a letter to Trump on Wednesday requesting assistance, Scott wrote that the state had already spent close to $40 million on its response. The Florida National Guard has deployed 3,500 members for search-and-rescue and humanitarian aid, with assistance from National Guard units from as far away as New York and Kansas. The Florida Highway Patrol has 450 troopers working in the Panhandle, while 150 Fish and Wildlife Conservation Commission officers are conducting rescue missions. Search teams — working by air, boat and on the ground — have entered Panama City, Mexico Beach, Alligator Point, Eastpoint, St. George Island and Apalachicola. The U.S. Coast Guard ran 10 rescue missions into the region Wednesday night. The Red Cross is bringing in 500 disaster relief workers. More than 5,000 people were in 34 shelters that have been opened across the region. Scott said one benefit of the rapidly moving Michael was that it hit during the day and was out of the state before sunset. More than 19,000 utility workers from companies in Florida and across the country have started assessing the damages. 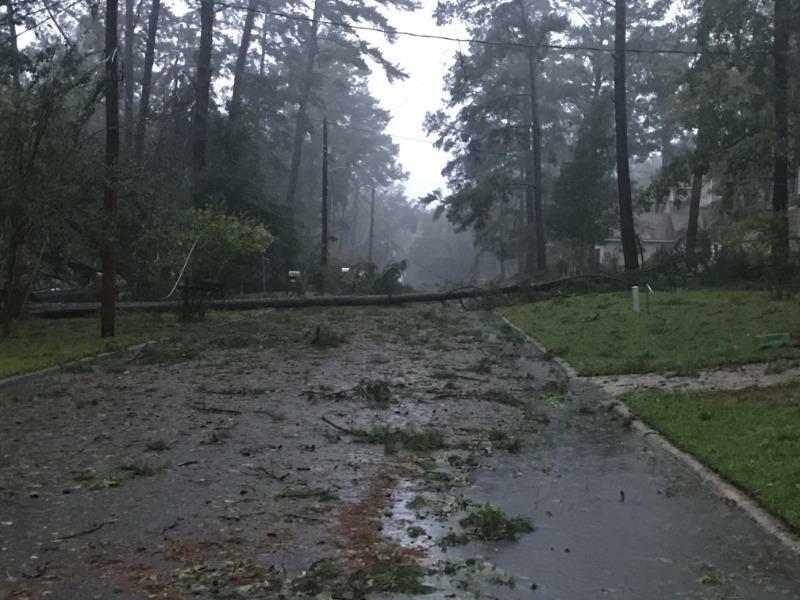 The Division of Emergency Management reported 400,666 customers of Gulf Power, Duke Energy and a number of smaller utilities were without power Thursday morning. Pensacola-based Gulf Power, which reported some 120,000 customers were in the dark at one point, said progress was made in its westernmost regions, but the hardest-hit areas may take weeks to rebuild. Calhoun, Gadsden and Jackson counties, which are north of Bay County, were 100 percent without power. Gulf and Franklin counties, which are on the coast, and Holmes County, which is to the north, were all more than 90 percent without power. Although Tallahassee avoided a direct hit from the Category 4 storm, Mayor Andrew Gillum said on Facebook that “our community has been pretty significantly impacted.” He said 110,000 residences and businesses were without power Thursday, morning, representing about 90 percent of the customers served by the city’s electric service. In addition, Gillum said the storm knocked out one of the city’s sewage systems, including the backup power source. By comparison, about 75,000 customers lost power during Hurricane Hermine, which struck Tallahassee in 2016, said Gillum, the Democratic candidate for governor.